Pablo de Pedro was born in Madrid, Spain. He studied piano and viola before moving to Austria in 2000 to study under Thomas Riebl. Subsequenly he studied with Veronika Hagen and in 2005, completed his studies at the Salzburg Mozarteum. He also took part in masterclasses by Nobuko Imai and Diemut Poppen. 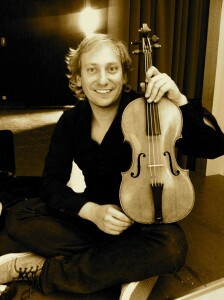 As principal viola with the European Union Chamber Orchestra he has performed across Europe, USA, the Far East and South America and has performed at prestigious festivals, including the Innsbrucker Festwochen, Ruhrtriennale, Salzburger Festspiele, Wiener Festwochen and La Chaise Dieu among others. He is a founding member of the Ensemble Delirio. Pablo complements his interest on period intruments with a passion for contemporary music and works with specialised ensembles including Klangforum and Österreichische Ensemble für Neue Musik.